On the 29th of January, the 2nd report from the Commission to the European Parliament, the Council, the European Economic and Social Committee and the Committee of the Regions on the implementation of EU macro-regional strategies (MRS) was adopted. Therefore, conducted in the light of the Council conclusions in 2017, this 2nd report presents the tangible results of the past two years in various domains and delivers recommendations in line with the draft proposal of the post-2020 programming period. 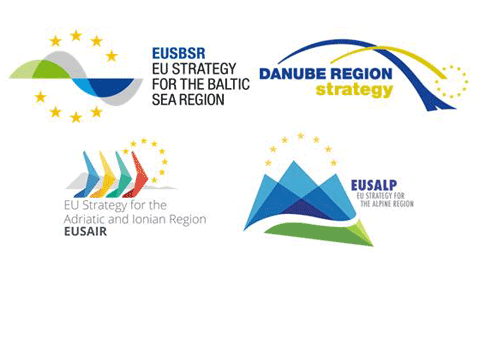 In fact, the four MRS, the EU Strategy for the Baltic Sea Region (EUSBSR), the EU Strategy for the Danube Region (EUSDR), the EU Strategy for the Adriatic and Ionian Region (EUSAIR), and the EU Strategy for the Alpine Region (EUSALP), provide a holistic framework to promote cooperation on specific territorial needs in 19 EU countries and 8 non-EU countries. On the one hand, the report stresses improving results on cross-cutting issues (policy making and planning, administrative capacity, governance, monitoring, access to funding as well as communication). In addition, some progress has been made on thematic priorities with a number of implemented projects across the MRS (environment, climate change, research, innovation and economic development). On the other hand, the report gives recommendations on five main priorities relevant to implementation improvements. For example, thematic coordinators should be able to assess the situation of each policy area and provide recommendations to national coordinators. Key implementers should continue to improve their governance mechanism by strengthening synergies among all regional and local actors. In addition, the action plans’ revision of the EUSDR and EUSBSR, should be the opportunity to select the most relevant core priorities (highest EU added value and worthy mobilizing EU and national funds). It is also highly recommended to strengthen links among national coordinators and managing authorities within each country participating in a MRS to benefit from the 2021-2027 programming period. Finally, the Commission suggests to execute the priorities, measure and projects in a coordinated way across MRS, as agreed by EU Programme authorities during the implementation phase. Consequently, this 2nd report opens a large range of possibilities to make the functioning of MRS’ more efficient at national and local level within the 2021-2027 programming period, as the motto “think macro, act micro” suggests. A staff working document accompanies the 2nd report, to refer more in details to the achievements and challenges MRS are embracing.